When you already operate 144 aircraft, have outstanding orders for another 217 aircraft of which 38 will be delivered in 2018 and a further 112 by the end of 2020, then you clearly have an optimistic outlook on future demand. And when you are operating in some mature markets, being creative about where and how you develop becomes increasingly important. Norwegian are certainly meeting that brief. Whilst the airline’s reach and growth has taken the carrier to nearly every corner on the planet, perhaps the most surprising element has been just how much the carrier has been developing in Scandinavia. As the table below highlights Norwegian will offer in excess of 27 million seats from Scandinavia in Summer 2018, an increase of some 25% over the last three seasons. 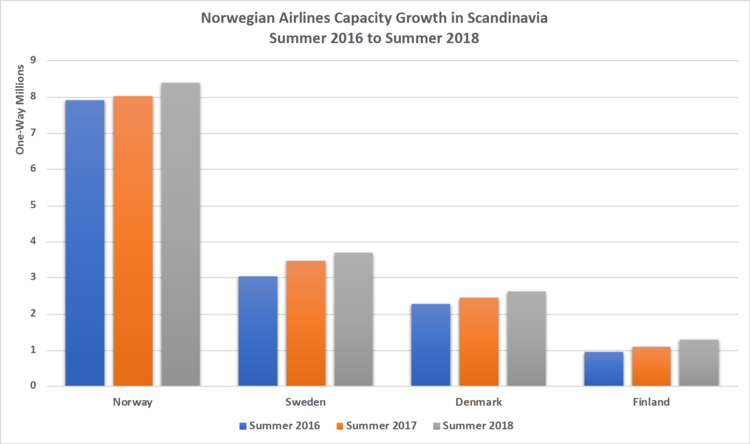 And whilst Norway naturally accounts for 52% share of the airline’s capacity, Norwegian have a significant presence in the other three markets as well. The chart below highlights a key differential in the network and operating models of Norwegian and their closest rival SAS. 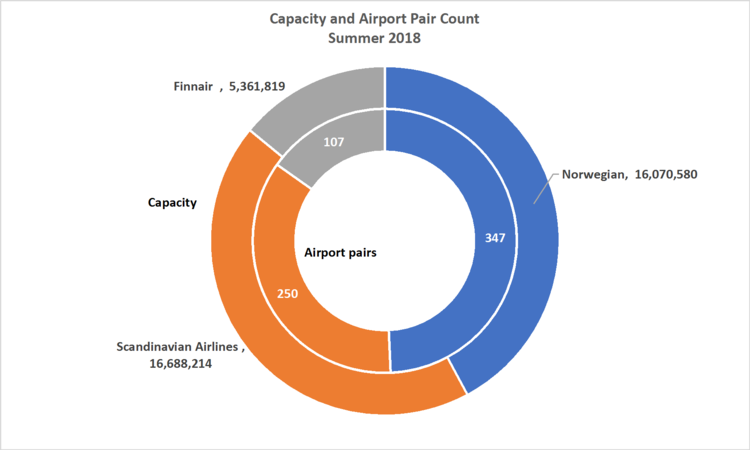 Whilst SAS will produce some 16.7 million seats this summer across some 250 airport pairs; Norwegian will operate 16.1 million seats across 347 airport pairs, an average of 46,313 seats per pair compared to SAS’s 66,752. Perhaps quietly and surprisingly for some, and despite rapid growth at London Gatwick, Barcelona, Malaga and Madrid, the rise of Norwegian to a leading market position in Scandinavia, head-to-head with SAS and with levels of growth previously not seen in those markets is as much of a story. But the key question is where next for Norwegian from Scandinavia? Short Haul, short of opportunities – further opportunities for expansion of short haul services from Scandinavia to Europe would appear limited. Norwegian will operate some 318 city pairs from Scandinavia this summer, 20% more than SAS and way ahead of Finnair’s reach. And whilst many of those remain operated at less than daily frequency, a mix of slot availability at either end of route and market demand would suggest that there is limited room for further development across the short-haul network. Long Haul, market changing opportunities – for Norwegian the largest opportunity in Scandinavia appears to be based around increasing the range of long-haul services. The geographic advantages of Scandinavia for connectivity to Asia are already well known but many markets remain unserved. In total some 39 airport pairs will be operated this Summer from Scandinavia to the whole of Asia and with half of those operated by Finnair from their efficient Helsinki hub it would seem to point to plenty of opportunity. Asia offers potential for Norwegian across both established capital city markets, new leisure destinations and emergent cities. Classic destinations such as Bangkok, Singapore, Hong Kong/Macau and Kuala Lumpur with their low-cost facilities are strong contenders, whilst in the leisure sector secondary markets in Thailand, Vietnam and Malaysia are all seeing growth in long-haul services and connectivity to Europe through a combination of Middle East hubs and direct charter services. And then of course China is an opportunity in some shape or form. With its increasing demand for services to Europe it provides an interesting fit to the Norwegian brand and its popular product offering. For Norwegian, it would seem the question is not so much “which” but “when” to launch many of these destinations when faced with so much choice and, of course, at what frequency or seasonality. No doubt, regulatory hurdles will be appear as they inevitably do in what remains a seemingly free but in some ways restricted market, but for Norwegian, staying close to home and flying further may be a valid strategy for the next few years.